As you probably know by now, I love finding spiritual lessons in everyday life. There is nothing sweeter than hearing my Heavenly Father whisper, “Are you seeing this? Do you understand?” Such an occurrence took place last week. Barnabas and I were on our morning walk around the neighborhood. As usual, he was behaving like a perfect gentleman, and I was relishing in the months of training that finally paid off. Suddenly, I spotted a small white cat approaching us on the sidewalk ahead. At first, the feline seemed oblivious to our presence, so we continued, me being certain the cat would flee when he noticed us. I was wrong! Not only did the cat remain on course, but he also gave no indication he saw us except that his eyes were fixed on us. No other reaction. No fluff. No hiss. No arched back. Nothing. The crazy thing didn’t even slow his pace but continued strolling toward us with confidence. As I mentioned, Barnabas has come a long way in his training, and he usually does very well when it comes to passing by the temptation of a stray cat or running squirrel (though he is still wholly intrigued by groundhogs). His typical response is to watch and pass by without a second glance. But these were not ordinary circumstances. This was something new. I’ve never seen a cat act like this...and neither had Barnabas. When my mutt realized the cat’s bravery, he slowed his pace and lowered his head to glare at the cat. The feline remained calm and continued forward. At this, poor Barnabas turned and looked at me with the funniest look I’ve ever seen (and the dog can pull off some hilarious faces). He didn’t know what to think but more than that, he didn’t know what to do. I understood exactly how he felt. Not willing to observe the showdown between my 90-pound pit bull and the 5-pound kitty, I pulled Barnabas over the ditch where we could safely pass by on the side of the road rather than the sidewalk. As the distance between the cat and us grew, Barnabas’ eyes never wavered. He watched the cat as the cat watched him, still unfazed by the giant coming his way. Then I noted in amazement as my huge dog nudged me in the opposite direction of the coming feline. As I inched further into the road, I realized Barnabas was no longer amused. He was afraid. He was ready to get away from that crazy cat who was now staring at us from the corner of his eye as we passed. With a final glance over his shoulder, Barnabas took off across the street, dragging me in his wake. The entire ordeal only lasted a couple of minutes, but the whole time I was thinking about David and Goliath. Barnabas could definitely pass for a Goliath (though he is much sweeter), and the cat, well, as far as size is concerned, he was a David. Despite the difference in size, the cat seemed unafraid. He was unmoved by the giant before him and continued to press on. In the case of David and Goliath, the shepherd boy defeated the giant and chopped off his head. Lovely! In the case of dog versus cat, the cat also defeated the dog. Not with a sword, a sling, or a stone, but with courage. His boldness in the face of a giant so bewildered and confused my poor pup that Barnabas ended up being the one to run in fear. I’m guessing he figured if the cat could be that brave in his presence, then the cat must know something he didn’t. It was enough to shake the confidence of my curious canine. The incident left me wondering how often we could defeat our enemies by simply being bold and courageous. How often could we send Satan and his minions scampering by merely holding fast to God’s promises and marching confidently no matter what giants we face? 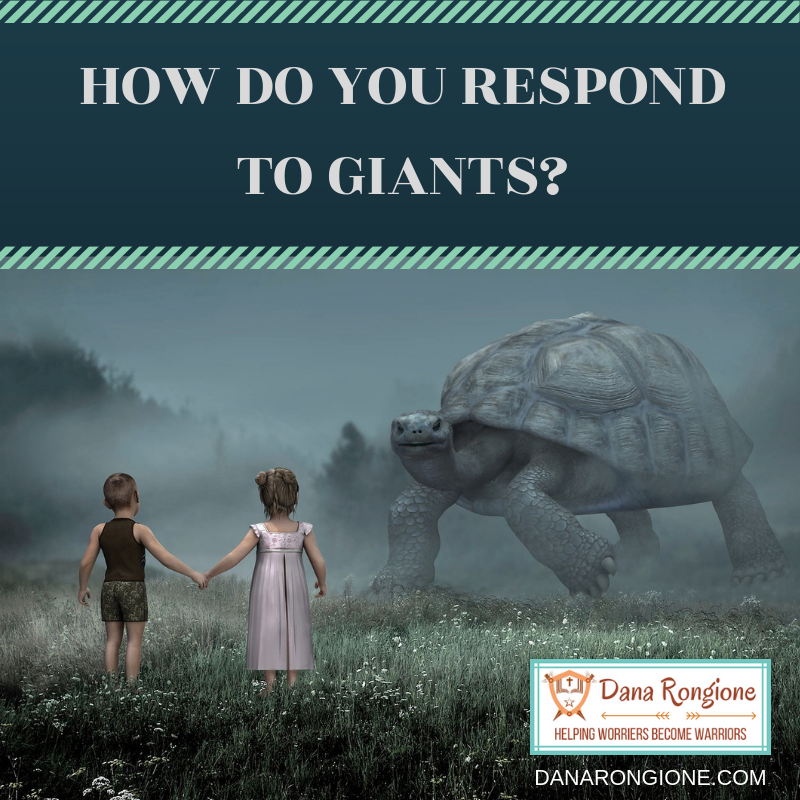 How many times would our giants fall because of our firm stance on the Word of God? I don’t know about you, but I’d like to find out. I’m tired of always being the one afraid. I’m sick of being the one to back off or run and hide. I’m fed up with allowing the enemy to get the best of me. It’s time for a change. It’s about time I stood up to my giants. After all, if God is for us, who can be against us? No one! Not even a giant. Or a rather large pit bull. For several moments, the soldiers survey the faces of those around them. Fear. Indecision. Shame. Finally, a single warrior steps forward and proclaims, “I will go with you.” Within a few seconds, another steps forward and then another until, finally, each soldier has joined the fight. What made the difference? What motivated the fearful warriors to risk their lives? Their decision could be attributed to the love of their country, the respect for their commander, or even the moving speech given by their superior officer. But I believe the most significant contributing factor to their decision to go forward was the courageous stand of one of their fellow soldiers. A single man compelled an entire army to throw caution to the wind when he dared to step forward. You could say his "courageous" was contagious. Few of us want to be the first to take a stand, but as Christians, that’s what we’ve been called to do. We are soldiers in the Lord’s army, and we ought to motivate others to take a stand that makes a change. We ought to be the first to step up and say, “I’ll go.” And if we’re concerned about standing alone, we need not be. First off, the Bible assures us we are never alone. God is on our side, and He will never leave us or forsake us. But not only that, when we dare to take a stand, we inspire others to do the same. Our "courageous" becomes contagious. Just imagine how we could impact the world today if each of us were willing to step forward and join the mission. Consider how many others we might inspire by our bold obedience to the call of Christ. Our Commander is asking, “Who will join me in this fight?” How will you respond?